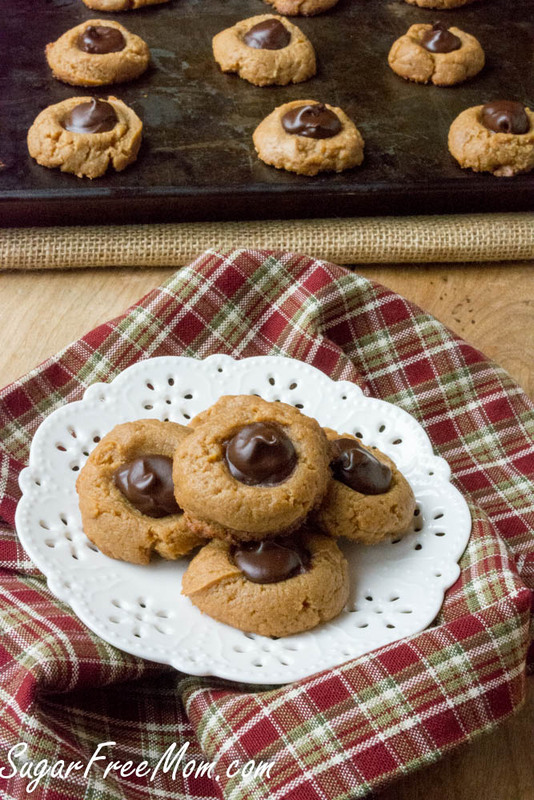 These Classic Peanut Butter Cookies got a “Better-For-You” make over! 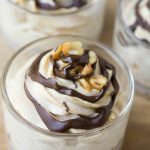 Keto, Gluten Free, Sugar-Free, and Low Carb plus easy to make! The holidays are coming and that means lots of shopping, cooking and baking! Let’s face it though, the holidays can also mean lots of stress, but the baking shouldn’t be. When you’ve got some fool proof cookies in your arsenal you won’t be stressing at all this holiday season! Everyone is busy and it seems there isn’t enough time to get everything done in a day during the holiday season. Baking holiday cookies and goodies for family and friends shouldn’t be something that consumes all your time. 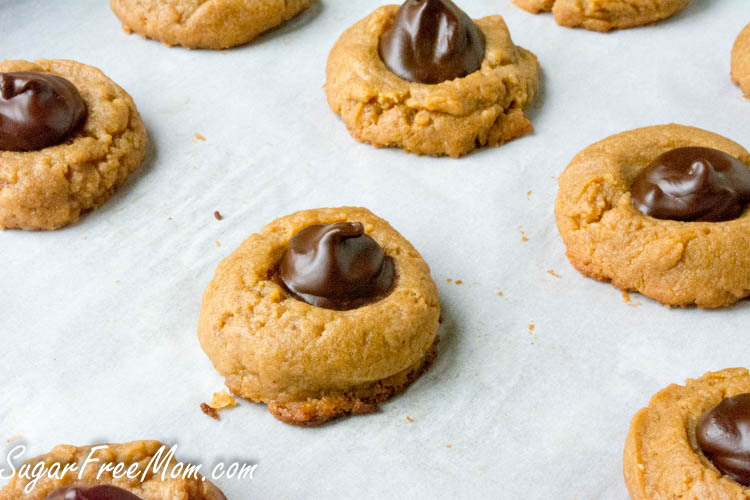 This easy, delicious and classic recipe for peanut butter blossoms is just what you need to add to your list for stress free baking. It’s just one of those recipes everyone loves and looks forward to seeing on the holiday dessert table. 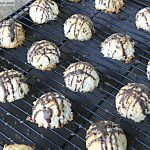 With a little improvising for the sugar free chocolate center instead of the classic chocolate kiss, you won’t get any complaints from anyone once they try these better-for-you traditional cookie. 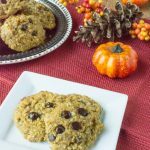 The cookie itself is gluten free and grain free and comes together quite easily with just a few ingredients. 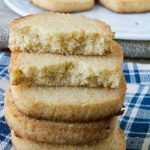 A little melting, a bit of stirring and just 10 minutes of baking time, these can be prepped and made in under 30 minutes. You’ve heard the phrase, “Butter makes everything better” right? Well even if you haven’t, it sure holds true in this recipe. 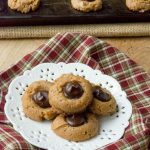 Salted butter is just what’s needed to take ordinary peanut butter into extraordinary soft, chewy, fudgey cookie! 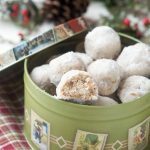 Other traditional Christmas treats you might like are my Pecan Snowballs and Candied Pecans. These can be frozen for at least a month as long as they are carefully packaged after cooling and air tight. Make ahead then pack in a cute little holiday tin for teachers, friends and family as gifts. I can’t think of another cookie that is more loved than this one, at least not among my extended family and friends. 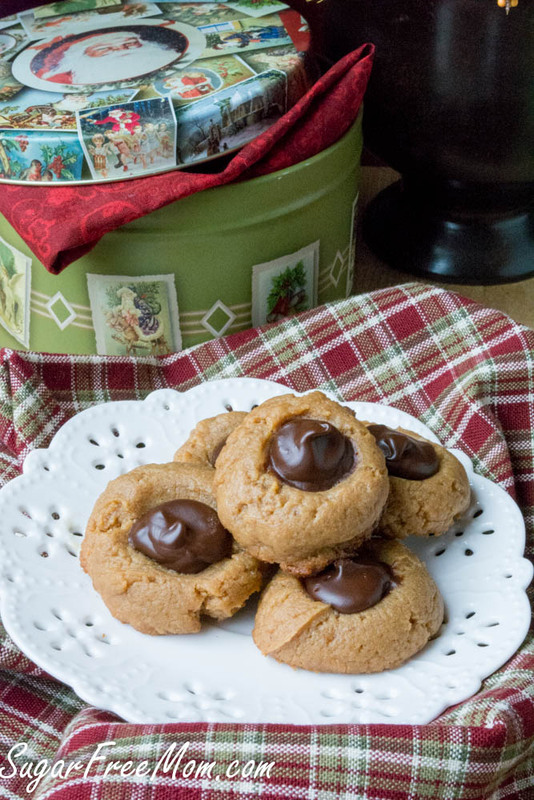 They honestly will never even realize these are sugar-free when they taste them and you’ll be amazed at how less stressed you feel once you’ve made a batch ahead of the holiday rush. In a microwavable bowl or in a small bowl set over simmering water, melt the butter and peanut butter together. Stir until smooth. Stir in the vanilla extract, stevia, and Swerve until smooth. Mix in the egg and stir until smooth. 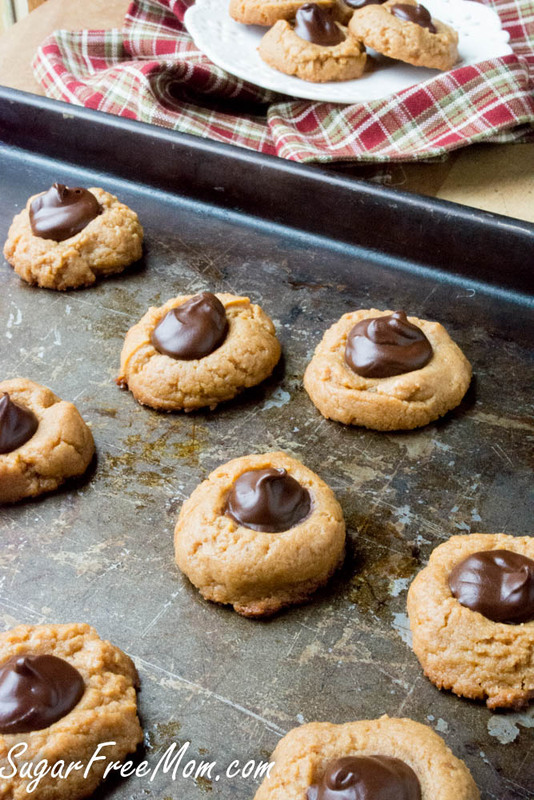 Use a tablespoon to measure out 20 cookies and place them onto a parchment lined baking sheet. 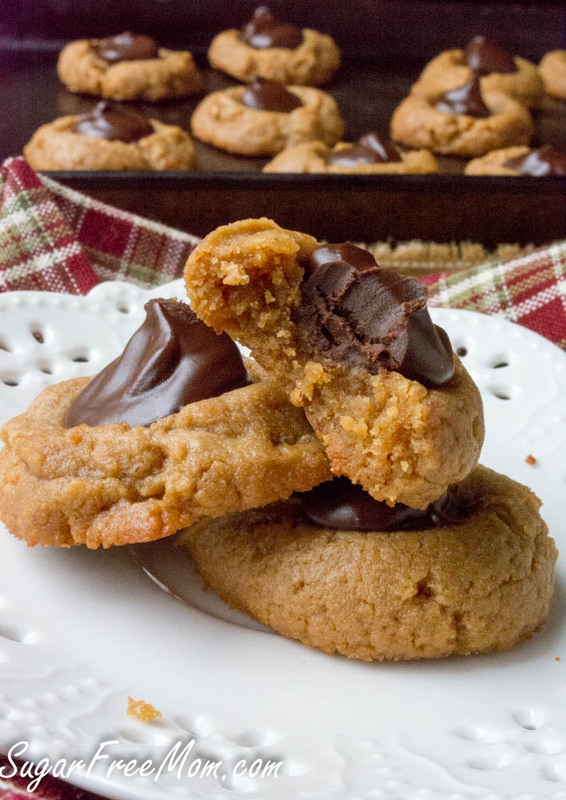 Use a rounded 1/4 tsp and push the bottom of the teaspoon in the center of each cookie. Remove from oven and use the teaspoon again to the center of each cookie. Once cooled, melt chocolate chips and butter together, stir until smooth. Mine took 1 minute in microwave. Spoon chocolate into the center of each cookie. Allow to set or refrigerate for 30 minutes. This recipe was first posted in November 2016 and updated in November 2018 with video. I hope so, that is what I plan on doing. Omg these were a favorite of mine and somehow you made them look even better than the famed Hershey kiss ones! I have several newly gluten intolerant friends! These would be great for their friends-gifts this holiday season! Is pyure powdered sweetener the same at the swerve confectioners sweetener? Different brand which I’ve not tried, but should work, although need to be careful some brands of sugar free sweeteners are sweeter than others. These are fabulous. Almost like candy! Wonder if one could double the recipe without messing it up. ? I think it should work, thank you! They came out delicious. Thank you for the recipe! Did you let them cool completely before handling? Did you change any ingredients? Can I mix up some PB2 and use in place of peanut butter? I’m sorry I’ve not tried that as a sub, but most likely it would work fine. I made these today but I think that the brand of peanut butter and the xylitol I used must have made a huge difference to the outcome. They were very moist when I first mixed them and there is no way the mixture could have sat on the tray in a cute little mound like yours did. I added some almond flour and a bit of coconut flour and they turned out a treat. I am keen to try with another brand of PB and see if they are more dough-like after mixing. Regardless, I will make them again. What a decadent treat! I think they will be fine to freeze. I made these today and they turned out really good. I did have to add about 4 tsp of Almond Flour because the mix was too thin but I did not beat the egg, so thought maybe that was why the batter was thin. Next time I will beat the egg. Will definitely make these again because they taste very similar to the real thing. Thank you for the recipe. Which Peanut Butter brand did you use and can I use Kerry Gold butter instead? I like the 365 brand from Whole Foods. I’m stunned there is no almond flour or coconut flour to hold this together. Also, the 4th ingredient down says, “1 Vanilla liquid Stevia” ? ? ? 1 What? Thank you, just edited, it’s teaspoon. It will work without the vanilla stevia but you need to add sweetener to replace it. If you don’t have a scale to weigh it, use about a cup worth. 1 drop or teaspooon of liquid stevia?? Can you do unsalted butter with sea salt? If so, how much sea salt would you add to both the dough and the chocolate middle? Yes unsalted is fine, I’d probably use 1 tsp in the dough, only if your peanut butter isn’t salted, maybe just 1/2 tsp if it is. No need to add salt to the chocolate, the butter is just a small amount to make it thinner. I got sugar free mini Reese cups. Was planning on using mini muffin tin to bake cookies and press the Reese cup in center. Do u think will work? I dont have the chocolate chips. Is there anything I can do with baking chocolate squares to make it taste sweet? I used a bar, 4 ounces, of Bakers brand unsweetened. I melted it in the microwave with about half of the butter called for and some liquid stevia to taste. Err on the side of less stevia and add more as needed to taste. Going to make these with flax egg to make them egg-free and vegan. Just one Tbs. fresh ground flaxseed mixed with 3 Tbs. water makes a flax egg. Do these have any fiber? Just wondering if the carbs listed is net carbs or total carbs. Thanks brenda but there is alot of swerve in it isnt it sweet enough with that? Also I dont have lillty just sugarfree chocholate chips those will work? You might find they are sweet enough with the swerve but to me they were not sweet enough when I tested them without vanilla stevia added. Any chocolate will work to melt and place in the center.